I had a telephone interview this morning with the Renton correspondent for the KOMO News blog. Here's the link to her post. She contacted me a few days ago and I coordinated with Gail about it, who then reminded me I could also post here now that the interview has been published. Apparently the reporter found my work on the Renton Facebook page, though I wasn't able to find it. 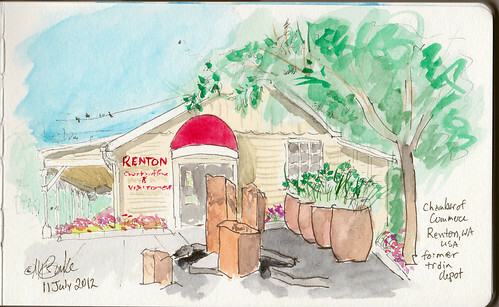 I thought it might have been the sketch I did of the Renton Chamber of Commerce as the staff came out and photographed the drawing to put on their Facebook page. This is that sketch, done back in July. Maybe it's what started the chain of events that led to this interview.